Out of the so many brands that make inflatable stand up paddle boards, the Zray gained a great popularity within the surf and water community for its brilliant designs and outstanding quality. One of their most attractive iSUPs is the Zray X2; it’s sure to make your head turn once you spot it; unless you are the owner; that way you’ll be making heads turn for you. In this review and with no further delay; we’ll try to talk about everything that is special about the Zray X2 for a closer image for anyone who’s interested in this killer board. Heavy gauge Mesh PVC ensures airtight performance. The Zray X2 is a medium sized inflatable paddle board that measures 10.10 feet for length, making it a great touring board. Saying that it’s medium by no means imply that this board is not enough for a large rider; on contrary, the Zray X2 can take up to 320 lbs with no struggle. This very same board is 30 inches wide which I’d say is the standard for all quality iSUPs. Thus, you should guess that you’re getting nothing but the best. Those 30 inches are enough to keep anyone standing tall in complete balance with just a little practice even if you were a beginner. Another standard figure for inflatable standup paddle boards is the 6 inches thickness that makes sure the board does not submerge under water even when it reaches its weight capacity. All in all, the dimensions of the Zray X2 are pretty neat and strategic for water people who are on the go and who seek something easy to handle. The Zray’s brand screams one thing; durability. 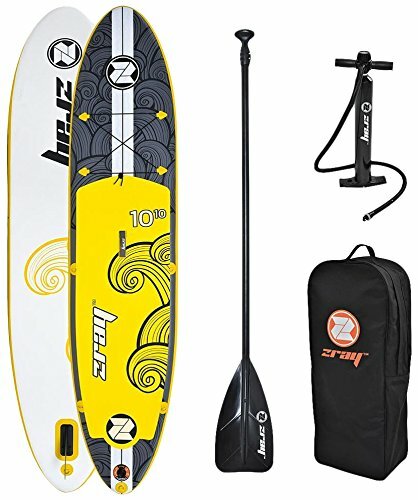 Added to the fact that this board is really attractive; the X2 is made of extremely strong PVC material that is known for making any inflatable board, Zodiac, river raft feel as hard as ever. The Zray boards’ are built using extra reinforcement tapes to hold the board’s shape for years. 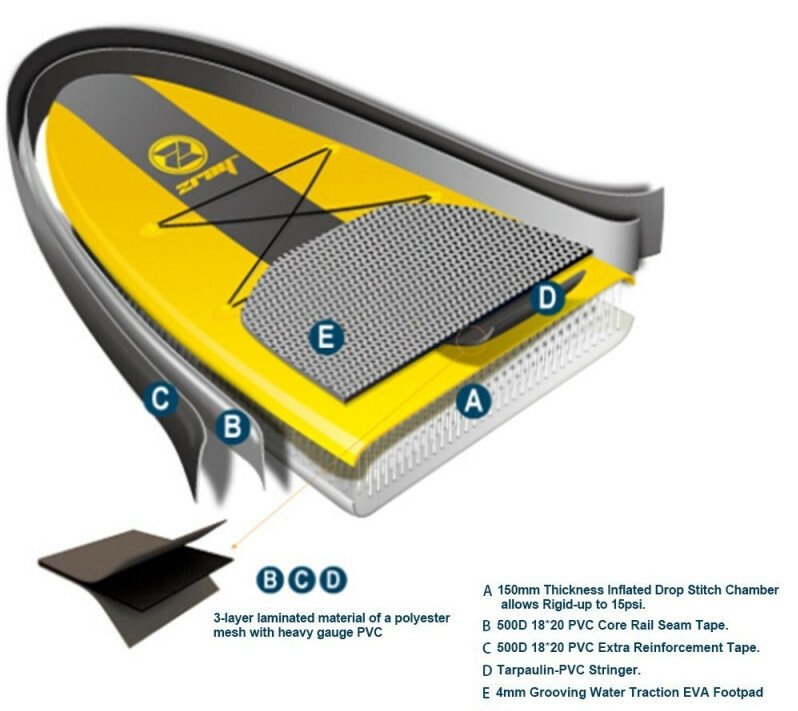 Also, the Korean drop stitch technology used to construct the air chamber turns the board very stiff and rigid with a pressure capacity that reaches 15 PSI. The lower side of the board is where lots of work goes; it’s an exposed area to rocks, sharp items sometimes and dings. That’s why the Zray thought of using extra tough 500 D PVC layer to make sure nothing gets to the board. The most noticeable thing about the Zray X2 is its amazing design and color choice. It’ll outstand every other board around you. Then comes the yellow traction pad; it’s bright, soft and really grippy. It also adds to the stiffness of the board making it harder and sturdier. The navigation system on this board has one large removable fin that works pretty well in different water conditions. You’ll also find the usual storage area with 4 stainless steel D-rings and a bungee cord. It’s plenty of space for any kind of cargo. Another 4 D-rings are on the sides of the board so as to attach a kayak seat for those who like to paddle sitting. The last and 9th D-ring is near the air valve in case a safety leash was needed. And finally, there is a central carry handle by which you can one handedly transport the inflated board. This is the fun part about the Zray X2. This board is swift and stable on flat water. It keeps great tracking and it responds very well to the paddle and body movement. Moreover, the sharpness of this board makes it really versatile; it could be taken on rivers and open oceans and it would still deliver a pretty badass performance. Concerning speed; I’ve tried some iSUPs that are more or the less the same design as the Zray X2, but I can say that this latter did better than many others especially in flat water. However, the Zray X2 is not a racing iSUP, that’s why speed should not be a huge concern right here, but if you need to check out a faster board by the same brand, you may take a look at the Zray R1 (12.6 feet long). A high pressure hand pump. A light weight aluminum adjustable paddle. And a good quality backpack where you can easily pack and store the board. Straight to it; this board looks really good! Great colors and design. It’s perfect for touring, exploring, and recreational paddling. It comes in a quality package. It’s made of the strongest materials known to iSUPs’ industry. It’s stable, responsive and extremely durable.